People don’t go to the movies to be depressed that’s what they have the theatre for, or so says Centerstage’s production of Stones in His Pockets; a darkly humored Irish comedy that will tickle your funny bone and bring a tear to your eye in one whirlwind of sensational acting and side-splitting shenanigans. Two actors, a dozen or so characters, and one stage; it’s bound to be a night of utter hilarity even if there are emotions heavy as stones to fill the audience’s hearts. Directed by Derek Goldman, this inspiring comedy is a breath of fresh air to the common theatre-goer’s outing, a unique blend of sensitive souls buried beneath rich salty exteriors in potato country. Todd Lawson (L) and Clinton Brandhagen (R) in Centerstage’s Stones in his Pockets. Photo by Richard Anderson. The gloriously ridiculous outdoor-indoor set gives the audience an immediate idea of what sort of night they might be in for; a striking image to look at, the rolling greenery of Ireland captured with internal fixtures and a Hollywood film camera track plowing diagonally down the center of the stage. Scenic Designer Misha Kachman creates this unnaturally bright grassy turf against a blue sky backdrop and plaster-cake clouds that hang from above the stage, combining these elements to create this somewhat surreal feeling in the atmosphere. Kachman’s designs have all the markings of an “on-location” Hollywood shoot, complete with straggling flood lights strewn about on the side of the stage, an enormous boom mic. Hanging over the main play space and a random porta-john off to the far corner. What sets this production apart from other dark comedies is the seamless integration of the video projections and the unique use of vintage film reel footage to help further underscore the overarching plot elements in the show. Projection Designer Jared Mezzocchi utilizes a variety of old-fashioned film clips, including several moments of the blinking-circle countdown from antique film reel motion pictures, to highlight the notion of a live film being viewed before the audiences’ eyes. Blending these clips with live streaming footage, as if the actors were actually being recorded in present time, is a clever move on Mezzocchi’s behalf; fully showcasing his digital prowess and creative expressions. Voice and Dialect Director Leigh Wilson Smiley succinctly separates the slight variances in the Irish accents that are heard throughout the production. These subtly nuanced differences create a broader notion of the local culture involved in the area, showing the outsiders from the townies, the old ones from the young ones, and the Yanks from the natives. Klapper’s intricate e attention to style assists in the performers’ success in delivering both male and female characters with distinctive boundaries drawn between each character. Director Derek Goldman, working together with Movement Consultant Mark Jaster, creates a series of characters within these two exceptional performers that ends up populating the stage with a dozen or so believable individuals. Jaster, as the show’s movement consultant, inspires quick changes— executed through a simple physical spin— to showcase a new character in any given moment throughout the production. Goldman guides these sharply honed characters through the storyline of the show, at first a bit slowly, gradually gaining momentum and stumbling along the tragedies twisted into the plot before racing into the show’s “glimmer of hope” finish. The timing that is crafted into these character changes is perfected into a fine science, making comic execution for these characters virtually flawless. This really allows the natural laughs to resonate with the audience and exist freely, above the influence of feeling contrived. Goldman encourages a sense of belonging in the audience with his unique approach to creating extras for the show. While no audience members are specifically singled out, the two performers on stage treat the audience en mass as if they are the hoard of extras required in any given scene. This brings a unified feeling of belonging to those watching the show while making them an unobtrusive part of it. Goldman factors in audience responses to certain scenes as well, adding to the hilarity of the funny moments when they occur. The two performers, Clinton Brandhagen and Todd Lawson, are exceptionally skilled actors with a great deal of emotional composure when it comes to balancing dramatic moments in a dark comedy. The pair have a clear and concise fashion in which they relate to one another, crafting little moments of understanding between one another regardless of the character that they are playing in the moment. Each knows how to create the other’s presence without the other necessarily physically needing to be there, so that their conversations with the air actually feel like they are being addressed to living individuals. Lawson is loaded down with a great deal of the heavier emotional baggage, his anger and grief funneling out mostly in the second act through his extremely expressive voice. Lawson focuses the shifts in his characters in the language of his body, really digging into characters like “Old Mickey” the town curmudgeonly drunk, and the junkie Sean complete with body twitches that present the telltale signs of a life traveled down the darkened path. His sense of comic timing is sublime, particularly in moments where his main character, Jake, is sharing intimate sensual scenes with “Caroline Giovanni” (played by Brandhagen) the American tart Hollywood starlet. Keep an eye out for his over enthusiastic girly character as well, the incessant rapid clapping and chipper attitude of sheer perkiness will set your teeth on edge. Brandhagen’s main character also comes with a set of complex emotional breakdowns, delivered near the end of the production, but it’s his body language in all of characters that really sets his performance apart. Each character has a distinctive walk, way they hold their head, use of their hands when speaking; a series of carefully crafted details that makes each character more distinct that the last. Brandhagen’s portrayal of the Hollywood starlet is both sensual and overtly sexual in the same breath, creating a hilarious character that draws forth a lot of laughs from the audience. His furious outburst as the production manager character borders on maniacal but results in uproarious laughter from the audience. Stones in His Pocket is a touching comedy, with a little soul and heart in it for everyone, and it leaves a warm glint of hope at its ending (though that may just be a warm pile of cow dung). After all the most important thing you might see in this show are the cows, so be on the watch for them too. Running Time: Two hours and 15 minutes, with one intermission. 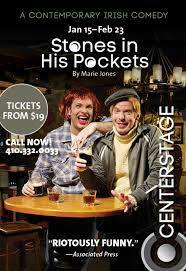 Stones in His Pockets plays through February 23, 2014 at Centerstage— 700 N. Calvert Street in Baltimore, MD. For tickets call the box office at (410) 332-0033 or purchase them online.